> Taleo > Success Depends on Talent. 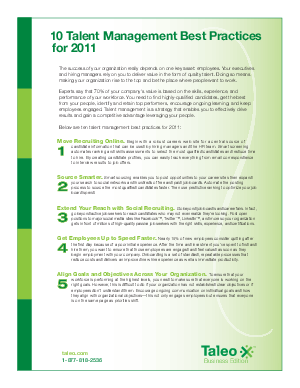 Get 2011 Best Practices. How do you really know whether your company is measuring up against the competitive landscape? It’s imperative to uncover every distinction that sets your company apart. Your people—or talent—is a valuable asset you can use to impact your success. The more you know about your talent, the more you can drive performance. Find and attract quality talent. Keep top performers motivated and satisfied to retain them. Reduce overall turnover to drive down costs. Focus employees on working toward company goals and objectives. Enhance performance with ongoing learning initiatives. Gain insight into your workforce to make the right decision to support growth.